Eurasia Consult was founded by Dr. Peter J. Peverelli. Dr. Peverelli started learning Chinese at age 14, resulting in a PhD in Arts (Leiden University) in 1986. He has 10 years of living and working experience in China. 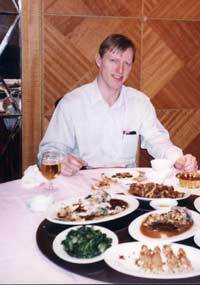 He has been active in the Chinese food and beverage industries since 1985; first working for Gist-brocades (now DSM Food Specialties) and since 1991 as an independent consultant. He combines this commercial work with a position in the Faculty of Economics & Business Administration of the Vrije Universiteit Amsterdam. Fluent in Chinese and equally comfortable in Western and Chinese culture Dr. Peverelli has proved his ability in bridging cultural gaps in an ever growing number of cases. Dr. Peverelli's interest in the region exceeds day-to-day business practice. During his work as a consultant, he has developed an organising theory that he uses and continuously develops during his work for his customers. This theoretical framework includes an explanation of the ways cultural differences interfere in business contacts between partners from different cultures. The academic work has lead to a second PhD in Business Administration (Erasmus University Rotterdam) in 2000. A volume can be purchased from Eurasia Consult. Dr. Peverelli strongly believes that theoretical insight is a necessary condition for success in practice and that practical work is a necessary condition for theoretical advance.